Extreme close-up, a green pic makes contact with the electric strings of Billie Joe’s guitar. A wide shot in flash animation of St. Jimmy coming into town, a bridge above the bay and hilltops as background. Close-up, strike of the guitar. To close-up on St. Jimmy’s boots. Begins to take off running towards us (camera) simultaneously hitting Slo-Mo as we zoom out to a wide shot. Then JumpCut back to street level/medium wide shot..
An extreme close-up of his boots. As he passes an ol’ granny with ol’ granny cart he swipes a bottle of wine and yanks off its cork. A strict looking female meter maid in sunglasses blows her whistle and stops a jaywalking St. Jimmy. She spreads him across her little meter maid mobile and pats him down. Reaching his inner thigh, her eyes go WIDE at what she discovers. And in tighter, with her arse and palms pressed up against the glass, we zoom past her to St. Jimmy at her back giving her a citation of his own. Extreme close-up, St. Jimmy zip’s up his zipper. St. Jimmy marches down the street. Going off in the middle of an intersection he pours forth the Holy Spirit of PUNK as cars/the trailing lights they leave behind zooming past in fast-forward from all directions. Are you talkin’ to me?! I’ll give you somethin’ to cry about! And all inside turn his way and raise their booze in greeting. Brings it back down, dips his middle finger in it and makes the sign of the cross with his holy brewski. but first how ’bout tossin’ in a few…? 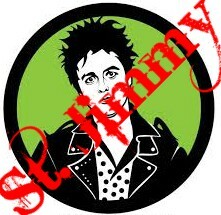 and meet St. Jimmy’s spawn!